She sings again Marie Fredriksson prepares to come back on stage. LAst year she stayed away from the audience and had a rest after the cancer operation. The photo was taken 2001. The uncrowned queen of Rockbjörn prizes, Marie Fredriksson, says in an exclusive interview for Aftonbladet that she prepares to come back on stage. With a solo album in English! - I am looking forward to it. Marie Fredriksson takes part in the 25th anniversary of Rockbjörn prizes. The famous singer has got not less than 11 Rockbjörn prizes during the years. She has got these prizes both as solo artist and together with Roxette. And many of you, the readers, has voted her every time so that she can win. Now Marie Fredriksson takes a break and relaxes at home to recover after the cancer operation. For the moment she wants to be just with her family. This year she has been seen just on a special occasion, in February, namely when together with Per Gessle, has got a medal from the king, and has been a guest at The Rolling Stones concert at Cirkus this summer. On "Mazarin" solo album which belongs to her colleague from Roxette we can hear her at the song "På promenad genom staden". - It was great, says Gessle about the singer’s contribution. For the moment she is working on new songs. Because this is what she wants. Right now she is working at a new album. And she estimates a lot her Rockbjörn prizes that she has got. Taking into account that Rockbjörn prizes celebrate their 25th anniversary, Aftonbladet could get an interview with the star, interview that they had been longing for for a long time. Marie, if I have to count your Rockbjörn prizes that you have got as solo artist - 5 pieces - and the ones that you have got together with Per for Roxette - 6 pieces – you have got the most of such prizes. How do you feel as an absolute queen of these Rockbjörn prizes? - I feel very well, great. I couldn't believe they would be so many and I am very proud and happy. 1986, 1987, 1988 and 1989 the Swedes continued to vote you as "artist of the year"... which is fantastic! How much do you remember those times? - A lot of work, travels and altogether have been something very nice but very difficult at the same time. Of course you have been a huge inspiration for many people. Who was your great inspiration when you were a child or a teen-ager? - Two celebrities: Joni Mitchell and Jimi Hendrix. Do you remember when you got the first Rockbjörn? - Of course. But I hadn't thought it looked so nice… But you get used to it during the years. Which of them do you estimate more, the ones that you have got as solo artist or the ones that you share with Per for Roxette? What does it mean to you that the people who vote are the readers of Aftonbladet newspaper and not a jury made of experts? - Of course it is something very special that the audience is the one who decides. I don't know if I should ask you, but where do you have these prizes today? In a box in the attic of the house? Or are they supports to lean books against them? Or you have them in the gym? - I have them all in my office. Will you vote for another person this year excepting Per? Now I have to ask you something that many people hope for – are you working for your next album? - What I am to do and I am loking forward to being ready with is to record a solo album in English. What do you want to say to the people that have voted for you all these years? - I would like to thank them very very much!!! Ok, Marie, the last question, do you promise that you will bake a huge cake and you will celebrate together with all your Rockbjörn prizes now, when they have their 25th anniversary? Marie Fredriksson has 11 Rockbjörn bears on her crown, that makes her the biggest owner of such prizes in Sweden. Five bears she has brought home as solo artist and six with Roxette. Four nominalisations for "the artist of the year": 1986, 1987, 1988 and 1989. Roxette was voted as Swedish "group of the year" in 1988, 1989. 1991 and 1992. Marie Fredriksson got also the prize for the Swedish "album of the year" in 1987 with the album "Efter stormen" and for Roxette with the albums "Look sharp", 1988 and "Joyride", 1991. Family: The children Josefin and Oskar and the husband Mikael Bolyos. Income: 4 768 800 Crowns. Her solo albums: "Het vind" 1984, "Den sjunde vågen" 1985, "Efter stormen" 1987, "Den ständiga resan, 1987 and "I en tid som vår", 1994. Marie Fredriksson falls down on the floor at home, in her villa from Djursholm outside Stockholm. She is driven immediately to Karolinska hospital with a serious concussion. 13th of September 2002. The doctors discover a brain tumor on the backside of her head. The tumor is operated away. 4th of October 2002. Marie leaves the hospital and comes home. 31st of January 2003. 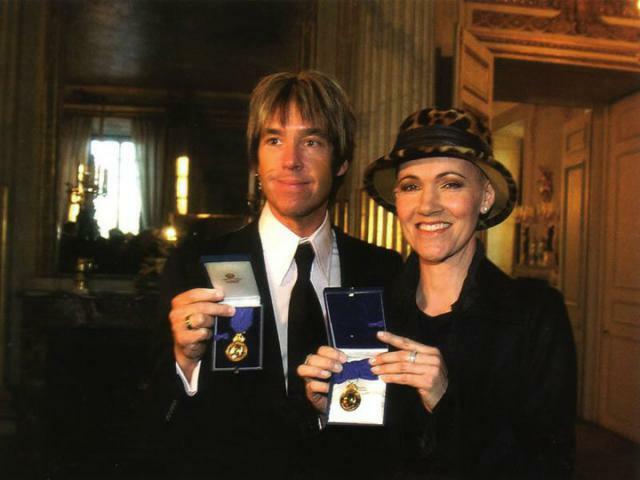 Roxette are rewarded with the Royal Medal H M (Hennes Majestät - His Majesty) for great work in the country and outside. Marie Fredriksson takes part at the ceremony and gets herself the medal from the king Carl XVI Gustaf's hand.